We have been pretty lucky recently here at The Smartphone App Review. We have reviewed a series of games that really don’t look like much, yet turn out to be absolute little gems full of gameplay and innovation. We are pleased to say that you can add Heartbreak, available for Android through the Google Play app store, to that list. The store front listing, which displays some unimpressive screenshots, really doesn’t to the game justice, as it not only looks great but it has a fantastic soundtrack and nicely complex gameplay. To be fair, the game only really shines graphically when in motion, with a colourful vibrancy that complements the smooth gameplay. It may have simple building blocks, but it really does look tasty in action. The developer really should add a video to the listing to get this across. The music and effects are remarkably good for an indie game, and put a lot of other games we have covered to shame. 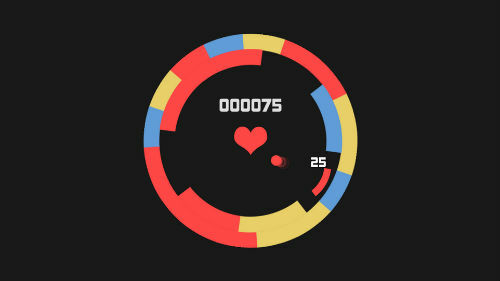 The game sees you in control of a series of blocks, arranged in a circle around a heart. The heart spits out an orb of a particular colour, and you must rotate the blocks to make sure the orb strikes the correctly coloured block. Each block disappears after being struck, rebounding the orb back across the game play field, changing colour and needing to be matched again. The gameplay is frantic, to say the least. The game adds many elements as you progress, including many layers of blocks and (for humble me) mind-boggling colour mixing. Now, regular readers will know that one of my personal bug bears with games like this is a lack of modes. Well, I am happy to report that there is no such problem here. There is the standard mode, with 23 levels, plus an ‘infinite’ mode and even a New Game plus with added powerups, unlocked when you complete the standard mode for the first time. Achievements, online leaderboards and even a colour blind mode, round out the options here. There is a free demo of this game available. Overall, this is a gorgeous little game that comes highly recommended. Difficult, but good-looking and sounding and with plenty of modes and levels, Heartbreak is a tricky little gem of a game.